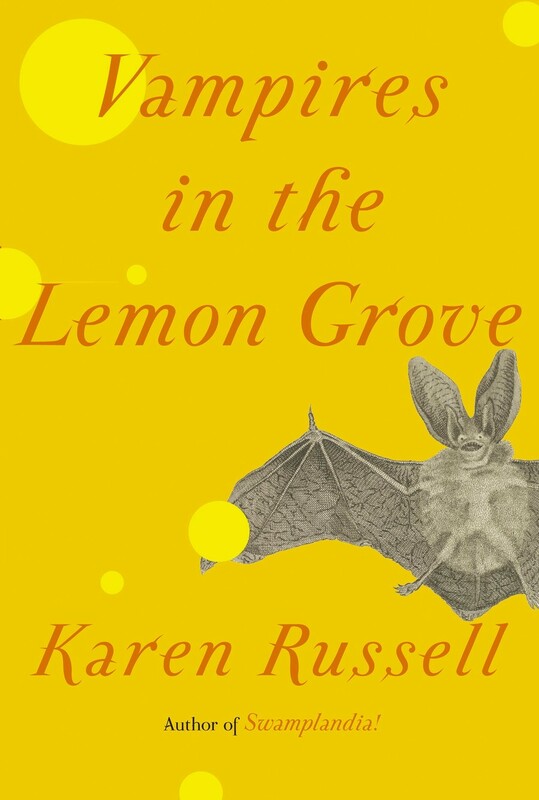 Karen Russell’s new lemon-colored book is batty in the best of ways. There aren’t too many writers who, still in the young, fresh dawns of their careers, feel compelled to throw caution to the wind. Reputations have been ruined with ill-timed forays into the experimental. It becomes clear, somewhere between the Japanese farm-girls mutating into swollen, furry-faced silkworms and the Antarctic tailgaters risking death to cheer on microscopic krill against behemoth baleen whales, that Karen Russell couldn’t care less. In her new collection of stories, Vampires in the Lemon Grove, she has no fear of failure. And if the short story is dying, she is determined to have it go out with a big, bizarre bang. But before delving further, the obligatory backstory: A native of Miami, Russell is a wunderkind of sorts who has astonished literati with her disarming oeuvre of fantasy, inventive prose, and off-kilter observation. Her debut short story collection, Lucy’s Home for Girls Raised by Wolves, was critically acclaimed, and her 2012 novel, Swamplandia!, was mired in a Pulitzer-Prize controversy when the prize committee—forced to choose between Russell, David Foster Wallace, and Denis Johnson—grumpily decided to recuse themselves from their only job: to give an award to somebody. But Russell has returned. Her new octet of short stories, with or without Pulitzer imprimatur, is a liberation of sorts, her first work situated outside the humid frontier of Florida. There’s something of a circus in Russell’s brain, and all the acrobatics and pyrotechnics come pouring out on page: Gulls hoard trinkets of the future in a damp tree hollow, great harvests of bone rise chalk-white in a prairie expanse, and vampires feel the pangs of unrequited love while they slake their thirst with tart Italian lemons. Given these cursory descriptions, it’s clear why Russell is primarily known for the outlandish nature of her work. She has an imagination that resembles the twisted lovechild of Hayao Miyazaki and H.P. Lovecraft, and it conjures entire landscapes and mythologies within twenty or thirty pages. In fact, Vampire’s short stories often read like excerpts from some lost sci-fi epic or chapters in a larger novel. This imagination is Russell’s greatest strength and most glaring weakness. When she is at her best, she provides a devastating blend of intellect, understanding, and symbolism. But in a handful of stories the gimmick dominates the narrative, and it becomes apparent that such imagination is only useful when coupled with insight. Stories like “Reeling for the Empire,” wherein Japanese girls are able to coil colored thread within their silkworm bodies, are beautifully written but serve no purpose other than pure entertainment. No more, no less. This dichotomy is most evident in the middle of the collection, with two stories that indicate Russell’s interest in the underbelly of the American Dream. The first is the sublime and near-perfect “Proving Up,” which won the 2012 National Magazine Award for Fiction. A haunting exercise in Gothic execution, the story is set in a late 19th-century dystopic heartland, where a federal Homestead Act mandates that in order to own a piece of land a family must build a claim shanty on the wanted land, maintain residency through drought and famine for five years, somehow grow a sustainable crop, and possess a glass window on their property. This last caveat is the “wink in the bureaucrats’ wall,” which, given the scarcity of glass in the area, is “a whimsical clause that has cost lives out here.” It’s a damning indictment of government’s disconnect with reality, an ingenious dig at the naïve yet sinister consequences of political games, and Russell never plays her hand too heavily. The second story, “The Barn at the End of Our Term,” features a doting, slightly neurotic Rutherford B. Hayes reincarnated as a “skewbald pinto with a golden cowlick and a cross-eyed stare.” His stable also houses an introspective Woodrow Wilson, a feisty Eisenhower, and an overly ambitious Andrew Jackson. It’s Animal Farm meets 1600 Pennsylvania Avenue. It’s also Russell becoming a slave to her equine premise, relying on one (good) joke, and milking it for all it’s worth. It’s the difference between these two stories—the former a profound yet concise commentary, the latter more of a half-boiled idea jotted down in one-liners—that Russell needs to avoid more consistently. Part of the problem is an identity crisis: Should she succumb to her wily gifts and entertain the masses, or cater to the somber definitions of “literature” that win awards, magazine covers, and whispered salvos of highbrow adulation? It’s a fine line, and in an ideal world, Russell will find a sturdy middle ground. Though she displays the same sentence-by-sentence mastery as her famed idols—George Saunders and Flannery O’Connor—she is not like them. She is, in many ways, better. Take, for example, her uncanny precision. She’ll pry you with finely calibrated stabs of description and insight, and entire characters are captured, released, in a single turn of phrase. The tension and layers of a story often unspool like a sudden sigh. It’s a literary acupuncture of sorts, and Russell operates with deft hands. If there is a further method to her madness, it is a refreshing focus on youth. In Vampire’s stories, adults are the louche figures of grown-up decay—needy, flawed, and broken. They are white noise, a house of mirrors in which children wander unseen and ignored. Russell’s stories bring these adolescents to the fore. In “The Seagull Army Descends Upon Strong Beach, 1979” teenaged Nal works constantly to supplement his defeated mother’s income; his belle d’amour, Vanessa, “rumbles around the house like its last working part.” Even Beverly, the forty-something protagonist of “The New Veterans,” tries “to wear her face proudly, like a scratched medallion,” but, “still feels like an old child.” Russell’s eccentric touch is by no means the happy magic of our childhood, but it is almost certainly the witchcraft of our adolescent interiors. Vampires in the Lemon Grove is an only slightly flawed addition to Russell’s burgeoning legend, and her voice promises depths that have yet to be explored. She need only temper her novelty with the more enduring traits of restraint and self-awareness; if she is to realize her full potential, she must better moderate her prodigious imagination so that her beautifully sketched characters aren’t suffocated by her zany premises. Regardless, in an era of insufferably self-serious authors, it’s inspiring to encounter a writer who can craft a powerful tale about a soldier’s magic tattoo and glistening trapezius muscles. And let’s acknowledge the most important fact—she’s 31 years old. She’s got time, and so do we.